“Beethoven” redirects here. For other uses, see Beethoven (disambiguation). 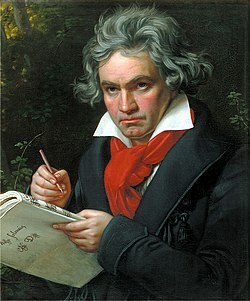 Ludwig van Beethoven, baptised 17 December 1770 – 26 March 1827) was a German composer and pianist. The crucial figure in the transition between the Classical and Romantic eras in Western art music, he remains one of the most famous and influential composers of all time. Born in Bonn, then the capital of the Electorate of Cologne and part of the Holy Roman Empire of the German Nation in present-day Germany, Beethoven moved to Vienna in his early 20s, studying with Joseph Haydn and quickly gaining a reputation as a virtuoso pianist. His hearing began to deteriorate in the late 1790s, yet he continued to compose, conduct, and perform, even after becoming completely deaf.